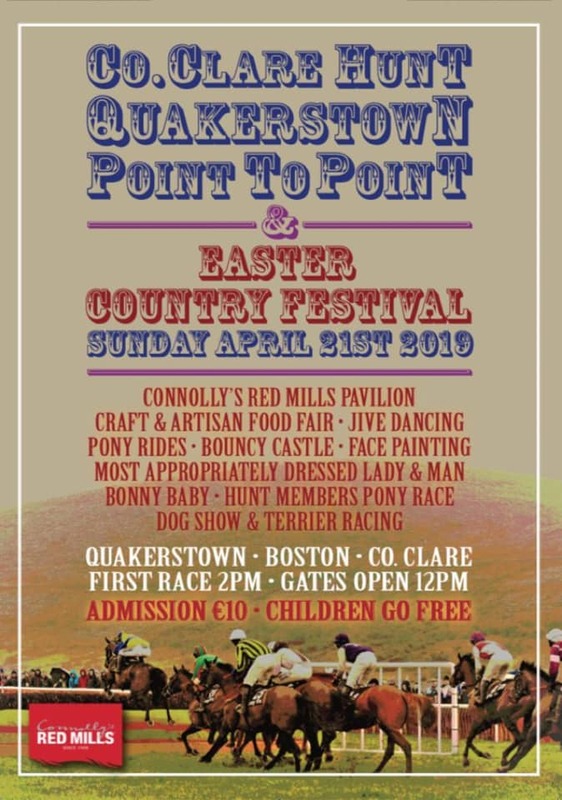 Quakerstown Point-to-Point and Easter Country Festival, under the auspices of the Co Clare Hunt will take place in Quakerstown, Boston, Co Clare on Easter Sunday, the 21st April 2019. The track at Quakerstown is set against the backdrop of the majestic Burren, and promises to be one of the highlights of the season. This year the Quakerstown Point to Point will be held in conjunction with Connolly’s RED MILLS and this exciting announcement was made last night, Tuesday 9th April, at the event launch at The Inn at Dromoland in Co Clare. The launch was well attended by Co Clare Hunt Members, event sponsors and well known faces from Co Clare and the Point to Point fraternity alike. There were a number of excellent guest speakers including Pat Breen TD for Clare and Minister of State for Trade, Employment and Business, Jane Davis, Equine Brand Manager for Connolly’s RED MILLS, Richard Pugh of Tattersalls Ireland and P2P.ie, leading lady rider Liz Lalor and Frankie Ward of HRI. As part of the continued sponsorship deal the track will feature the Connolly’s RED MILLS Pavilion which will allow patrons to enjoy all the thrills of Point to Point racing with added comfort, refreshments, live racing from Fairyhouse. This year it will also feature a Jive dancing session with Tom Jive, which will encourage people to show off their dancing skills and win some fantastic spot prizes. Quakerstown has proved to be an excellent source of young talent in recent years with Cheltenham Festival Grade 1 winner, Champagne Fever starting his career with a win at this meeting in 2011. Another exciting young talent to come from this meeting was Bacardys who went on to win the Grade 2 bumper at Aintree and the Grade 1 Deloitte Novice Hurdle in Leopardstown in 2017. The 2016 meeting also saw the exciting Next Destination land the four year old maiden and he is now a multiple Graded winner over hurdles including a Grade 1 at Naas. Other famous names originating from Quakerstown include Seabass, Mall Dini, Ball D’Arc, Up for Review & Royal Knight. The day promises to be a wonderful day of racing and entertainment for everyone. There will be free admission for children, along with wonderful free attractions such as pony rides, face painting and bouncy castles. As this meeting is a very important part of the local community, extra effort has been made by the committee to enhance the enjoyment of the occasion for all the family and nowhere is this more evident than in the style stakes with amazing prizes to be won by all the family. One of the main features of the day is the Most Appropriately Dressed Lady competition which has a prize fund of over €1,500 to the lucky winner. This amazing competition features prizes for the lucky winner from RED MILLS Store, Newbridge Silverware, Chez Lee Beauty, County Boutique, G Nine Boutique, Monsai, Flax & Bloom, Seodin & Gretals Petals to mention just a few. Don’t worry the dashing men of the point to point scene have not been forgotten and there is a most appropriately dressed man prize worth over €500 which features prizes from RED MILLS Store, Patrick Bourke Menswear & Louis Copeland as well as two tickets to the Punchestown Festival to name but a few. There is also a competition for the Best Accessory which features a prize fund of €400 which includes a bespoke hat from Margaret O’Connor Milliner as well as a necklace from Burren Jewellery. Judges on the day for these events will be top model Mary Lee of Chez Lee Beauty, Mandy Maher of Catwalk Modelling Agency and top milliner Margaret O’Connor. For younger members of the family there is a Bonny Baby competition judged by Leonora Carey and with an overall prize of a voucher for Bumble Bee Creations and a Thomond Pharmacy hamper. There are also a prize for the toddler category of a wonderful Hippomottie Learn to Dress Toy and a prize for the baby category of Bumble Bee Creation voucher. Following the success of the Craft & Artisan Food Fair at the Easter Country festival last year, the committee hope to build on its success and this year it will again feature local crafts people and food producers selling a wide range of hand produced goods. There will be a wide number of stalls displaying the finest of local and Irish produced goods such as woodcraft, candles, jewellery, food and cakes. 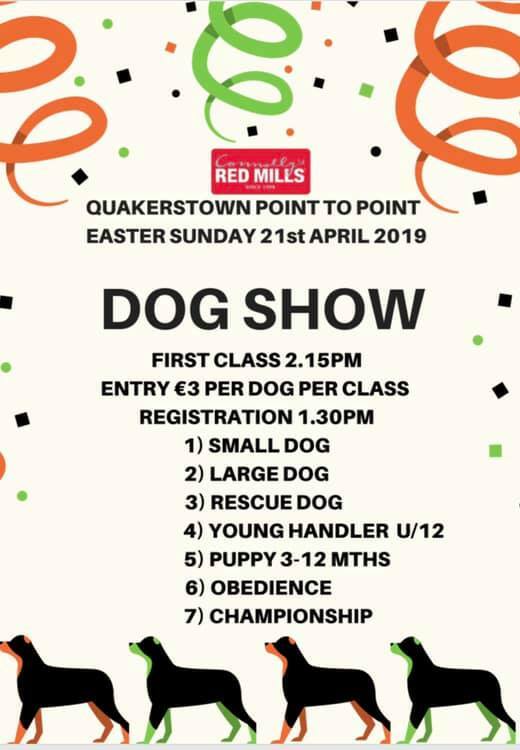 The fun however doesn’t end there with the Connolly’s RED MILLS Dog Show on the day. The Dog Show will have seven classes, with an entry fee of €3 per dog per class and there will be rosettes and prizes for the winners. This year the meeting will also feature terrier racing for the first time and will allow your dogs to show off their speed and see who has the quickest terrier in the land. The last race on the card for the day is an added bonus of a junior Co Clare Hunt members Pony Race. The younger members of the hunt are eagerly awaiting a chance to show off their skills at the track and hopefully a future champion jockey will be discovered in the process.